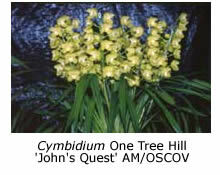 Cymbidiums will generally tolerate extreme conditions with little apparent detrimental effect. However there are a few climatic extremes that cause serious damage, both immediately and in the long term. Frost is one of them. 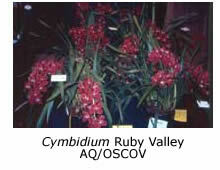 Exposure of cymbidiums to cold produces a range of effects. 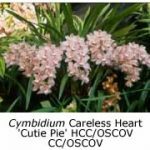 The first signs of damage are spotting of the flowers and ‘burning’ of the labellum, both along its sides and at its extremity. The sepals and petals are often affected with purple or brown spots, while lip burn generally results in brown, dead tissue (necrosis). The pattern of frosts varies from district to district, with higher latitudes, higher altitudes and areas away from large bodies of water being most susceptible. Frosts occur on clear, still nights when the heat from the earth’s surface can easily escape and in the Melbourne area are most likely to occur in June or July and again in September. It is rare but serious if there are more than two frosts in a row, as the second one is generally more severe than the first. This pattern can be markedly extended in areas subject to a continental climate, especially where other factors such as latitude or altitude are involved. It is important to know your area and the possibility of the occasional temperature extremes, as once the damage has occurred it cannot be reversed. Duration of exposure to frosting or freezing. 3. The amount of moisture within, on and around the plant. As the external temperature falls, there is a linear cooling to 0°C whereupon frosting develops on the surface of the plant. As the temperature continues to fall, freezing of the plant tissues commences, generally at about minus 2-3°C and this is where serious damage begins. The reason why it requires this negative temperature is because sap (being water plus dissolved substances) has a lower freezing point than water itself. In addition, a considerable amount of heat is required to be lost by the plant to merely change from 0°C as water to 0°C as ice (latent heat of fusion) and this requires extreme cold of moderate duration. 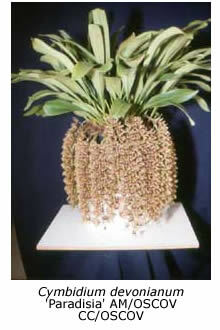 Frosting may damage or destroy flowers but its effects on other plant parts are generally reversible. Freezing invariably destroys the flowers and permanently marks the leaves; in extreme cases it may kill the plant. Frosting for brief periods is less likely to cause lasting damage than for longer periods. Mild frosts usually develop just as the sun rises, last for an hour or so and then pass as the temperature continues to rise. This generally results in minimal or no damage. When the frost develops early in the night or when it is followed by a cloudy period (rather than the usual sunny day), prolonged exposure to cold will result. In this situation, as with extremely low temperature, damage can be severe. Plants that are relatively dry are generally believed to tolerate lower temperatures than more hydrated ones and certainly it is better to have dry plants than wet ones as the temperature falls. 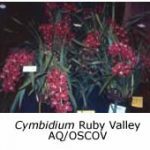 This may be explained by the fact that sap expands as it approaches freezing, and therefore a dry plant will have better tolerance to freezing than a fully hydrated one. Water on surfaces will rapidly freeze as the temperature falls below 0˚C. Wet surroundings will to some extent act as a buffer to negative temperatures. 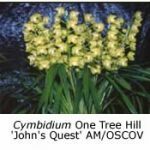 Some clones are more susceptible to frost damage than others, as is readily apparent in larger collections where numbers of different clones are grown. This is obviously genetically determined and applies only over a small temperature range. Sepal spotting and lip burn are both clone- and grex-specific. 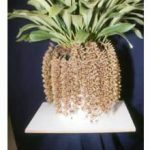 For example, Cymbidium Mallana ‘Lily May’ is very susceptible to cold spotting, while its sibling, C. Mallana ‘White Beauty’, is resistant. 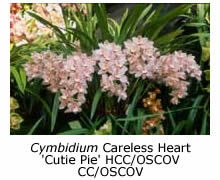 White albino cymbidiums are especially susceptible to brown marks along the length of the labellum, while the progeny of C. Cariga ‘Canary’ and others have a tendency to ‘burn’ on the tip of the labellum. Shade cloth does not offer any effective protection against frost but an enclosed plastic or glasshouse provides 2-3°C protection. 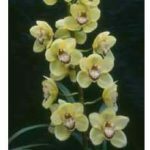 At lower temperatures orchid houses will require added heat. You should study the heat source most appropriate to your situation and consider factors such as insulation, gas fumes and cost versus the minimum expected temperature in your district. 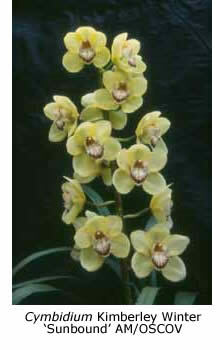 Cymbidium plants an their flowers are reasonably tolerant of temperature variations. However, one error and a whole year’s effort can be lost. Be aware of the impact of frost, know your area and take suitable precautions to protect your plants in the event of the occasional heavy frost.